At first glance, Hitch seemed to have been talking only about the unique visual power of film, as when he told Peter Bogdanovich in 1962: “'Pure cinema' is complementary pieces of film put together, like notes of music make a melody.” He even once claimed that Rear Window was the finest example of "pure film," because the camera adhered to a rigorous scheme that insisted on telling the story from the viewpoint of a single individual—photographer L. B. Jefferies (James Stewart)—thus placing the audience inside his head and keeping it there throughout the entire film.i From this, it might be easy to conclude that, for Hitch, the idea of “pure film” has to do only with what happens in the cutting room. But I would say that he had much more in mind and that his use of Rear Window as an example might have made for a good sound bite, but it sidestepped his deeper intentions. As I see it, for Hitchcock, “pure cinema” was the art of using cinematic techniques—both visual and aural—to create an experience for audiences that would take them out of their daily lives to inhabit a dreamscape constructed by the director. Of course, even the most basic entertainment does that: I don't know about you, but three minutes into the most banal soap opera and I'm hooked. The quantum difference is that Hitchcock's films take cinema's innate quality and create a heightened reality that's the result of deliberate, masterful and intentional control over all aspects of their creation. Hitch's aim was to bring his audience into the world of his movies, to feel emotions alongside his characters; better yet, to feel what Hitch himself felt. Using the camera as an audience surrogate, you could say that he wanted the audience to actually be a character in the film—not just as a silent observer, but as an active participant, asking questions that the film would go on to either answer or deflect. Last night I was watching Lifeboat with Amanda. At one point she turned to me and said, “Am I supposed to like Willi” the Nazi U-Boat captain? My answer was, “Yes. And you're supposed to feel guilty about it.” She did. Thus, pure cinema is a combination of all the individual elements that go into a movie, working together to serve this single purpose: to draw the audience mentally, psychologically and emotionally into the world of the film. 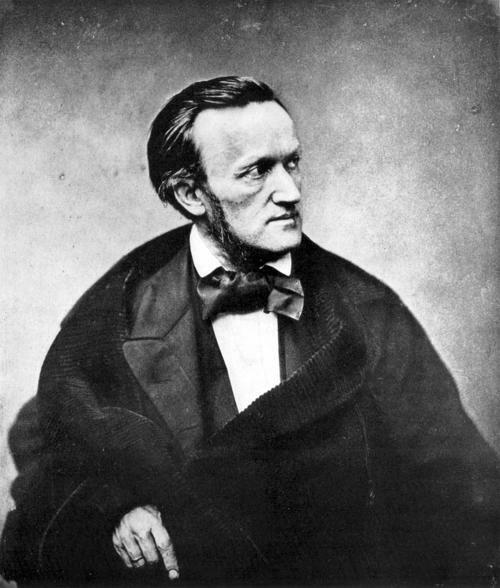 Like Hitchcock, Richard Wagner (1813 - 1883) had a lot on his mind. As a pure cinema practitioner, Hitchcock was the leader of that charge. I think it's entirely possible, if not probable, that Hitch, who was keenly aware of his genius as a film maker, saw himself as a modern-day Wagner. Though he never publicly articulated it as such—he was shrewd enough to avoid such grandiosity—his practice of pure cinema is analogous to Wagner's idea of Gesamtkunstwerk. In an online discussion, Hitchcock author Dan Auiler observed that Bernard Herrmann's work makes the films he worked on “operatic.”(He cited the composer's work on Orson Welles' Citizen Kane and Hitchcock's Vertigo specifically, though many more titles could be added. )v Dan feels that Herrmann's film music can be said to be “operatic in the sense of the music speaking for the character. But even that falls short of what Herrmann does, as the music speaks for the character and the director in ways that respond to the image we are seeing.” (Italics added.) As Hitch told Truffaut above, he practiced "pure cinema" in the service of eliciting a profound audience reaction. In Herrmann, he found a talent as great as his own for bringing that about. Bernard Herrmann's star turn in The Man Who Knew Too Much (1956). Hitchcock pursued the art of "pure film" as a Platonic ideal. The notion took hold during his silent years and it was a grail that he pursued all of his life. I believe that every single choice he made was in service to that ideal, for, in his mind, only pure film could arouse audiences sufficiently to 'wake them as from a nightmare.' Sometimes music served that purpose, but at other times, it could be an obstacle. Initially, Hitch envisioned Psycho's murder in the shower without music, but he was persuaded to change his mind when he heard Herrmann's iconic musical accompaniment. The entire length of The Birds contains not a single note of non-diegetic music—though Herrmann was brought in to help orchestrate the squawks and screeches of that film's star chorus. Still, As William Rothman wrote in his essay "The Universal Hitchcock," "pure cinema"
"was not the art to which Herrmann was dedicated. Herrmann swore allegiance to the art he called "melodram,"... which restored to music what he felt was its rightful primacy. In the case of [the shower scene in] Psycho, Hitchcock allowed Herrmann to prevail, but the incident must have opened his eyes to the fact that he and his friend, whose genius was as undeniable as his own, did not ultimately share the same artistic vision." Music was a useful tool in Hitch's pursuit of "pure film," but it was only a tool. Some of his most sublime and impactful scenes contain no music whatsoever. In fact, he even dispensed with editing at times, delivering his "pure film" experience in a single, seemingly endless, take. Check back and I'll tell you how. Thanks for reading this whole damn post. Want more? Read Part 2! i That point is slightly overstated, as there are moments when the camera continues to roll while Jefferies sleeps. ii Diegetic music is what you hear from a source within the story, as when Vertigo's Midge plays Mozart records for Scottie. Non-diegetic music is the musical score that is overlayed on top of the movie, such as the orchestral music that accompanies Scottie's wandering around San Francisco. iii Similarly, Hitchcock reveled in his films' ability to reach across all cultures, bragging that Psycho shocked audiences in Japan in the same way they did America. iv In another fascinating burp of destiny, just as realistic painting reached its zenith in the 19th century, photography came along to put those realist painters out of work, especially in the portrait business. v Herrmann's contributions to Hitchcock's films include The Trouble with Harry (1955), The Man Who Knew Too Much (1956), The Wrong Man (1956), Vertigo (1958), North by Northwest (1959), Psycho (1960), The Birds (1963), Marnie (1964) and Torn Curtain (regrettably unused, 1966). vi Herrmann was given the choice of composing new music for the sequence—Hitch used the same material in his 1934 version of the film—but declined when he saw that Benjamin's music was still an ideal fit 22 years after the first film had come out. I enjoyed reading your article which gave me some new angles in my approach to the genius that was/is Hitch. Outstanding, Joel. Some of the best work you've done.